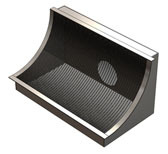 AMACS wedge wire intake screens are designed to completely meet customer specifications. Whether a single drum or a double drum (like a T-Intake Screen) is required, these screens are designed for a low uniform velocity through the consistently spaced, high open area and smooth screen surface. The exact slot opening is selected to achieve optimum performance for the pond, lake, ocean or river service. An air burst system will be designed and incorporated when customer’s specification require periodic cleaning of the screen. 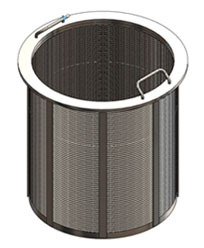 Dewatering screens are also known as sieve bend or curved screens. AMACS wedge wire type dewatering screens are designed to maximize capacity by using gravity and cross flow against the curved screen surface for removal of solids from a liquid process stream. Dewatering screens can be fabricated with most any slot opening, screen width or angle and are routinely mounted to a boxed style housing. Applications for dewatering screens include wastewater treatment, sewage treatment, agriculture, mining and food wastewater processing. Wedge wire screens are also particularly well matched to the requirements of high capacity filtration since they are self-cleaning, durable and reusable. Sieve bend (or curved) screens orient the wedge wires perpendicular to the flow direction which allows water to drop through screen and be collected as wastewater while the angle and flow forces the solids (or branches) to slide over the smooth screen. This product is effective in wastewater treatment, dewatering systems and other similar solid separation applications as well. Flat screen panels are used in a similar application as sieve bend and in shakers for sewage separation systems. AMACS wedge wire type underdrain screens are fabricated with flat high surface open area for the retention of costly media in down flow processes. 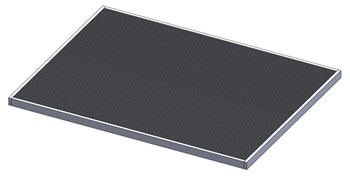 Typically, underdrain screens are made either with a surface finished plate flange or with a framing bar to be welded directly to the vessel wall. AMACS’ wedge wire digester baskets are designed and manufactured to meet customer performance requirements and other detailed specifications. 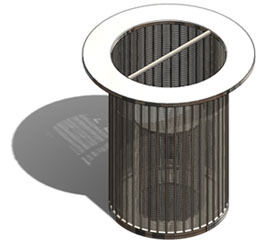 Wedge wire screens are particularly well matched to the requirements of high capacity filtration. These screens are self-cleaning, durable and reusable. Sieve bend (or curve screens) have the wedge wires oriented perpendicular to the flow direction which allows water to pass through screen to be collected as wastewater while the angle and flow allows the solids or branches to slide over the screen’s smooth surface. These screens are effective in wastewater treatments, dewatering systems and other water-solid separation applications as well. Flat screen panels are used in a similar application as sieve bend screens as well as in shakers for sewage separation systems.